Stainless steel floor sinks manufactured by StainlessDrains.com are offered in light to heavy-duty models. 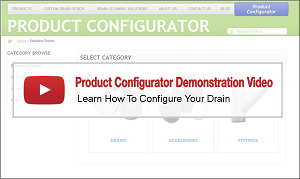 StainlessDrains.com’s drain specialists work with our customers to select the most effective stainless steel floor sink for each customer’s unique installation. Most common applications for floor sinks include food and beverage manufacturing plants, institutional and restaurant kitchens, maintenance rooms, wash down areas or any area with heavy flow. StainlessDrains.com’s sanitary floor sinks meet U.S. FDA standards. They are sanitary and corrosion-resistant. 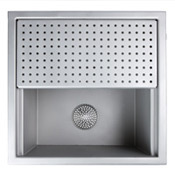 6 Inch Floor Sinks manufactured by StainlessDrains.com will satisfy any application from light to heavy-duty. All 6 Inch Floor Sinks are corrosion resistant and comply with the U.S. FDA Standards for sanitary design. 8 Inch Floor Sinks manufactured by StainlessDrains.com will satisfy any application from light to heavy-duty. All 8 Inch Floor Sinks are corrosion resistant and comply with the U.S. FDA Standards for sanitary design. 10 Inch Floor Sinks manufactured by StainlessDrains.com will satisfy any application from light to heavy-duty. All 10 Inch Floor Sinks are corrosion resistant and comply with the U.S. FDA Standards for sanitary design. StainlessDrains.com manufactures all our drains at our U.S. plant. Our 20 years of experience and expert sales staff ensure that we will recommend the most appropriate sanitary floor sink for each client’s installation, at competitive prices.